They tell fiction authors to “write what you know.” The same obviously applies to non-fiction. 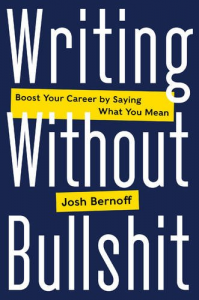 But it’s all too easy to go from that to “Write about yourself” — especially when it comes to self-help books. If you know about marketing strategy, write about marketing strategy. If you know about startups, write about startups. Just knowing isn’t enough; you should also do some research, gather some statistics, and come up with some case studies. It’s so obvious when someone writes a “focus group of one” book, which comes down to “this is what I learned when I did this project.” That’s not a book, it’s a blog post. That brings me to self-help books — and by that I specifically mean “Live your best life” kind of books. I should offer a disclaimer here — I like the life I am living and while I am introspective and have often asked others for advice, I have little interest in reading books to tell me how to be better. A lot of those books are about how to “Be who you are.” I know who I am, and that is how I am. I’m the world champion at “Be who you are,” which is no accomplishment at all. I suspect I am too old, experienced, and/or arrogant to be in the market for such books. But what about these who are younger, more open to coaching, and less arrogant than me. Should they read them? If you are a sociologist who has conducted surveys of thousands of people, then you may actually know something worth sharing about motivation and productivity and happiness. You should write that book, and people should read it. If you have interviewed many dozens of people to test your points and found patterns worth sharing — and you can tell those people’s stories well — then yes, you should probably write that book. People will enjoy reading it, and they’ll probably find something to relate to. This is especially true if your stories have a commonality: they’re about women managers, or people just out of college, or office workers in Silicon Valley, or people nearing retirement. If you have an incredible story, maybe you should write it. I know a guy who is both an insightful marketing analyst and who regularly crews tall ships on long voyages. That’s a story worth reading. So, perhaps, is the story of a person who triumphed over mental illness, or became a famous activist, or is a sports star. Those stories are great to read. But let’s not kid ourselves — for most people, it will be difficult to generalize those people’s experience into a lesson we can actually use. One the other hand, if you are one of the thousands of people who imagine you have found the “secret” to motivation, confidence, and happiness, please don’t write your story. Don’t tell us to be like you. Why should we listen to you? If you combine your focus group of one with some Web research, what makes you think we can all learn from it? What makes your insights special? You might squeeze an incredible speaking career out of a book like that. All you friends are going to tell you it is awesome. You might feel great about what you have shared, and you might reach a few people who are at just the right point to be ready to listen to your personal journey. But do we really need another book like that? I admit it. I’m a jaded, cynical guy who’s just read a few too many generic self-help motivational books. I’m a downer. I’m a party pooper. I actually expect evidence before I believe something. But really — why are you the person to write that book?